Oh, Pinterest. How you came along when I needed you most. I am a long-time lover of food magazines. Rachael Ray - Food Network - Good Housekeeping. It's a thing. But here's the thing - I'm also an avid organizer. There was just never an easy way to store and sort years and years of torn out recipe pages, at least in a way I would actually reach for. Then, Pinterest came along. (Insert holy angel singing here.) Be still, my organized heart! Six years and over 9,000 pins later (seriously. ), my Pinterest account bursts with seasonal fashion, decor, nail art, and, of course, recipes! Yet, with high volumes of anything, sometimes gems are overlooked and collect dust. Like this recipe from 2011. I pinned this with the best of intentions but this recipe bounced from board to board until this October. I cannot believe I waited so long. 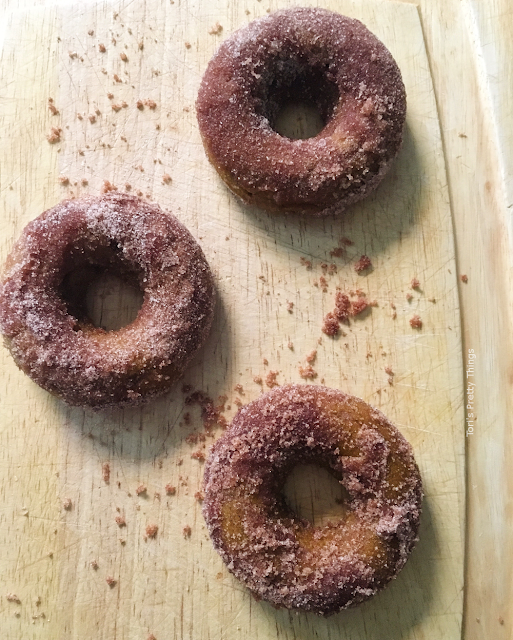 These donuts were DE-licious! 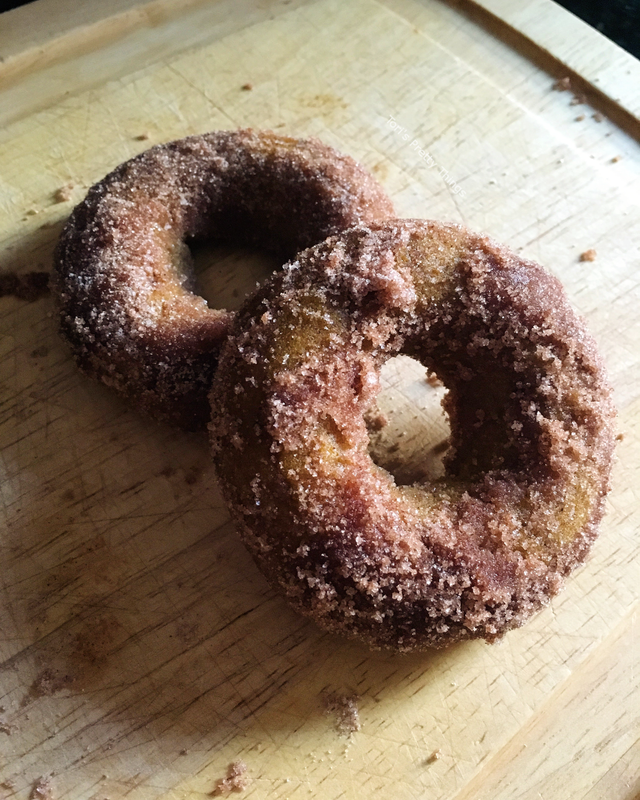 I followed the recipe as listed with a couple of minor tweeks, like using less butter and swapping in a full-size donut pan. I also did not heed their warning and coated all of my donuts in one shot. Be warned - they absolutely get soggy. B and I didn't care, though. They were still yummy all week long! I am so sad to see that these gals stopped blogging in 2013 but I highly recommend checking out their original recipe and blog anyway. It's an oldie (in the blog word, at least!) but a goodie :). 1. Preheat your oven to 350 F. I decided not to grease my pan but if you'd like to, do so now. 2. In a large bowl, mix your dry components - the first 7 ingredients. 3. In a second large bowl, whisk together next 6 ingredients - the oil, brown sugar, egg, vanilla extract, pumpkin, and milk. Mix until they're all combined. 4. Slowly mix your dry ingredients into your wet, adding a little at a time until they're all combined. Be careful not to overmix. 5. 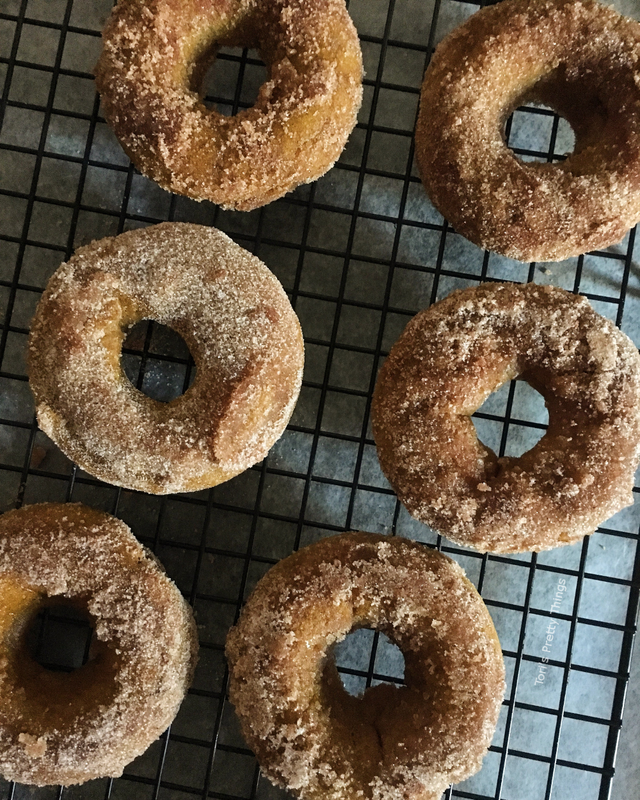 Next, add your batter to the donut cups and fill without overflowing. I used a pastry bag to do this but the Blue Eyed Bakers also suggested a steady hand and a spoon. 6. Bake 12-15 minutes. 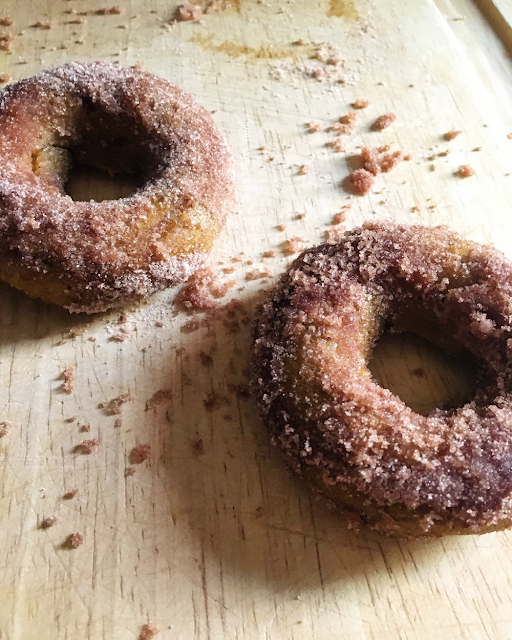 While baking, mix the remaining cinnamon and granulated sugar in a medium-size bowl until combined. 7. 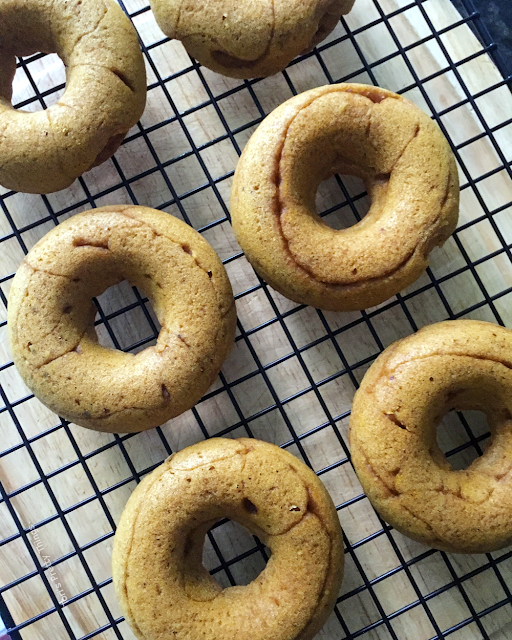 Once baked, flip the donuts onto a wire rack and let cool. 8. When they're cooling, melt your butter in another bowl. I melt butter my microwaving the butter on high in 10-15 second intervals until melted. 9. 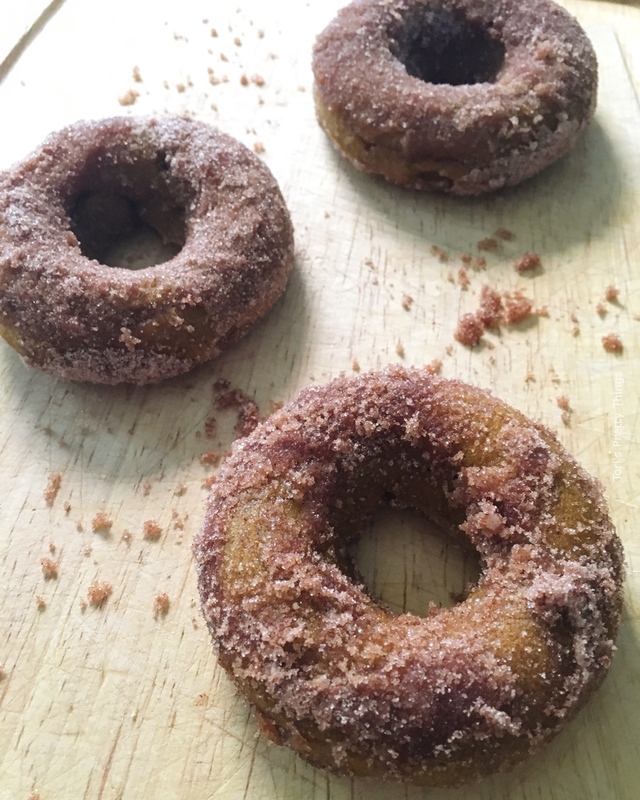 When the donuts are warm but cool enough to touch, dip each donut in the melted butter and then coat in the cinnamon-sugar.